EcoSphere is a calming balance of earth, water, air and life -- all parts of a working self-sufficient ecosystem that's much more than science; it's an original work of art. EcoSphere is a calming balance of earth, water, air and life -- all parts of a working self-sufficient ecosystem that’s much more than science; it’s an original work of art. 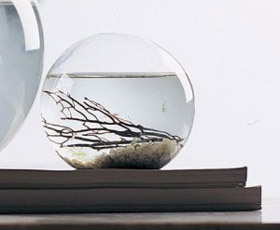 The delicate coexistence of animal and plant life (red shrimp, algae and microbes) thrives in the hand-blown glass sphere of seawater. It’s easy to care for -- just provide sufficient light and enjoy the aesthetic blend of science and art, beauty and balance.